Range: The Great Plains of North America, with the river valley of Saskatchewan, Canada being the northern boundary and Mexico being the southern boundary. Habitat: Prairie dogs reside in underground tunnels known as "coteries" or "towns." Diet: Grasses, forbs, roots, and flowers that grow around their town. Physical Description: The coat of a prairie dog may be either reddish brown, grayish, or light brown. Their undersides are buff and their tales are black tipped. Tail length is around 4 inches, but it varies from individual to individual. Prairie dogs have sharp incisors used to clip their food and strong hind legs so that the prairie dog is able to stand upright. General Information: Prairie dogs are actually members of the squirrel family; they just get their "doggy" name from the barking sound they make. Prairie dogs live in coteries, which consist of several towns. These towns are a complex series of underground tunnels which keep the prairie dog safe from fires and predators. Among the list of predators are hawks, various snakes, the now extinct black footed ferret, and man. Prairie dogs are remarkably sociable animals. Kissing, hugging, or touching noses are common greetings among the individuals of the coterie. Relationships within the coterie vary seasonally. The spring and summer seasons are often relaxed and friendly. Aggression builds in the fall and during winter months, the males often fight each other. This variation in attitude is closely linked to the gestation periods of the female. Breeding lasts from late February into April and actual gestation takes 30 to 35 days. 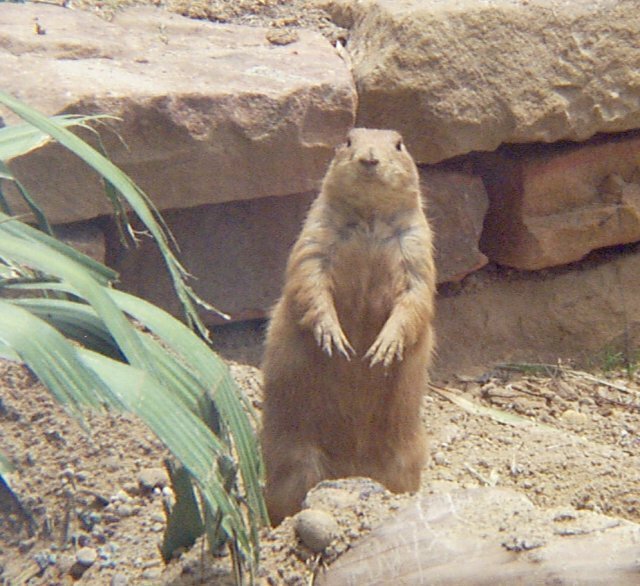 Man has been detrimental to the population of prairie dogs living outside of captivity. It is legal to hunt prairie dogs and the animals are often used for target practice or as the primary contestant in killing contests. Here are some examples of these killing contests. Cattlemen and farmers have worked to remove the towns from their land so that crops could grow and cattle could graze. Man's power has reduced the habitat of the prairie dog to 1% of its original size! Special Anatomical, Physiological, or Behavioral Adaptations: Prairie dogs have adapted to life on the prairie in several ways. They need very little water; the water from the plants they eat provide enough hydration. The sharp incisors are perfect for easily clipping grasses. Strong hind legs enable the prairie dog to stand upright, standing guard against possible harm. The vocal sounds of the prairie dog is advantageous for the animal. Barking to warn other members of the coterie, a rasping sound that warns of a pending attack, and the ability to scream when in pain are a few vocalizations that are beneficial to the prairie dogs. One of the greatest adaptations of the prairie dog is their homes. These tunnels are built at an angle to prevent flooding. In case water does fill their burrows, the animals have constructed a room above to act as an air pocket. The prairie dogs can wait for the water to go down in this additional room. Much like people, the prairie dogs have a separate area of their home that is used as a restroom and one for storage. 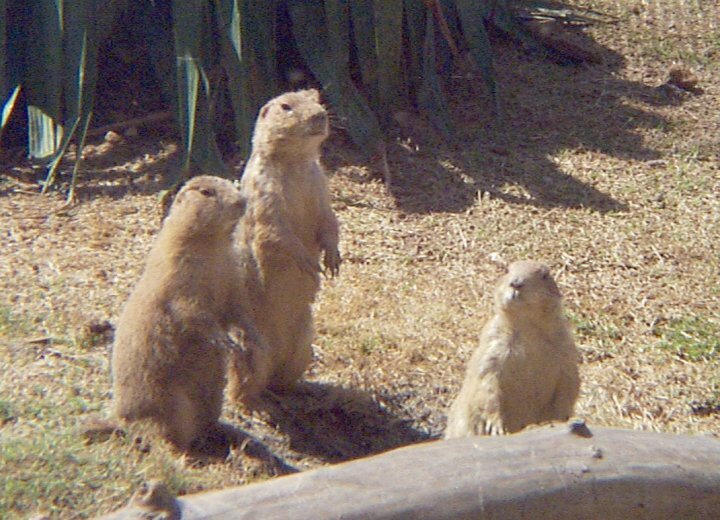 Comments about the Prairie Dogs of the Fort Worth Zoo: The new Prairie Dog Exhibit opened in the Texas Wild section of the Fort Worth Zoo in 2001. 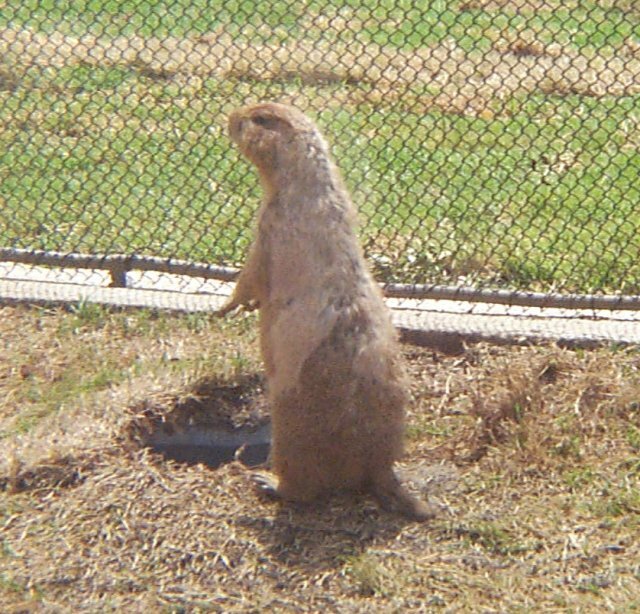 There are several prairie dogs on display, sharing their exhibit with burrowing owls. The exhibit includes more information about the prairie dogs and their habitat. Personal Observations: Prairie dogs enjoy the company of each other greatly. This is obvious in their play. The animals will tumble with each other and groom each other. At least one member of the coterie is always "standing guard." At the zoo, people do not seem to bother them too much. In the wild, they are a little more tentative about a stranger. The prairie dogs hold their food much like the squirrel ancestor - in their front paws. Arnold, Caroline. Prairie Dogs. Scholastic: New York, 1993. Costello, David F. The World of the Prairie Dog. J.B. Lippincott Company: Philadelphia, 1970. Grzimek, Bernard. Grzimek's Animal Life Encyclopedia. vol. 11, Van Nostrand Reinhold Company: New York, 1975. p. 225-231.